Disclosure: All the vape bags which we review on this website are tested by our trained, paid staff. As part of the review, VapingDaily.com links directly to the product or brands so that you may purchase directly from the provider. We receive commissions from these providers, however, this does not affect the price you pay, and the commissions we earn help us pay for the costs of running this website. Click here to learn more. Thank you. 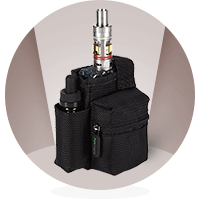 Any vaper who is serious about vaping needs a vape bag. Originally geared towards frequent travelers, they can be a great aid in organizing your additional vapes, e-juices, wires, wicks, atomizers and other tools. Moreover, a vape bag can serve as a great gift for a vaping enthusiast. However, with so many options claiming to be the best vape bags, choosing one can be a little confusing. If that rings a bell, this guide will help you wade through all the choices to get a bag that perfectly fits your bill. 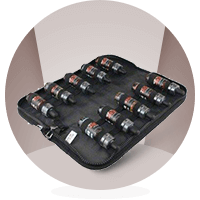 The Vaultz Liquid Locker is a heavy-duty nylon vape bag that not only lets you organize your vaping gear but also safely stores it. No matter if you are storing your vaping gear or, medication containers, it can come in real handy. Just stash everything in the bag, lock it up as it adds an additional layer of security to keep it away from kids and pets. The Vaultz Liquid Locker has 10 elastic straps to secure your e-juices and other accessories. The patent pending locking zipper uses the zipper pull as the latch for a sturdy combination lock pad. The lock instructions are included and are easy to follow. The case can perfectly fit your backpack, drawer, purse or glove compartment. 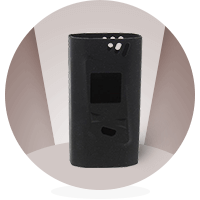 Available in black, this vape locker costs $34.99, which might be a little more than anything else on this list, but the build quality, elegant design, and level of convenience it brings to the table make it well worth the price. Looking for something really handy and not too noticeable, you can try the FoxVape Ego Travel Case. It is one of the best vape bags available on the market because of its small size and unique, innovative design. It is made from durable woven polyurethane and is so small that you can easily put it in your jeans’ pockets. Well in the sense of protection, we cannot really say the FoxVape offers as much extensive protection as other popular cases. However, the idea is to provide one single storage abode for your e-cigarettes and your other accessories. They designed the case to keep your e-cig, e-liquid and other accessories in one place. There is a stretchy side pocket meant to hold the e-liquid bottles and a small zipper section at the front for storing coils and accessories. The main compartment, which is meant to fit a box mod, is wide, deep and has a Velcro strap to hold it. It costs only $ 18. 03. 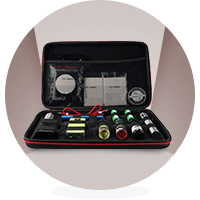 When it comes to the biggest names in vaping accessories, there is little argument about the standard that Coil Master brings to the table. They are one of the top players in the vaping industry. Therefore, the Kbag is one of their most sought-after items. The Kbag is made from a hard Polyurethane material and is almost the size of a laptop case. Needless to say, this big boy is for serious vapers. It features a strong zipper, and you will see a large piece of netting on one side of the case. The other side has a woven lattice style strap – the signature style of Coil Master. You can stretch the woven lattice style strap to accommodate virtually any vaping hardware. It can hold two large box mods, two double battery cases, six bottles of e-juice, and even the coil building kit. You may still have a little extra space to fit in some more accessories such as your cleaning tools. What sweetens the deal is the bag is available for $19.49-$25.99 from different sellers. For those who have the Smok Alien Silicone 220w Box Mod, you would not want to say no to Smok Alien Silicone Sleeve case. This protective silicone sleeve case can protect your Smok Aline from any wear and tear that can result from prolonged use. It also provides an extra layer of protection just in case you drop the device. You can find it available in a wide variety of colors. The case can only hold your mod, and nothing else. Personally, I am not a big fan of cases and rather prefer a bag. However, this can be a blessing or a curse depending on how much vaping gear you carry around with you. It costs under $5, which is cheaper than most cell phone cases. It is one of those vape bags that resembles a sunglass case, but it is a bit bigger. It can easily hold two bottles of e-liquid and a box mod. If you have vape pens in your collection, the case can house them too. Each side of the case has half pockets; two on one side and one on the other side. These pockets are well stitched, and the best thing is that they are stretchy. As you fit your vapes, they will not move. So, those who travel a lot and are looking for a small case or bag to hold their vapes, this one is for you. Both pockets face the same direction. For some reason, the pockets in the earlier version of the case were misaligned. One of the interior pockets was upside down. Because of this, things could fall out of the pockets inside the case while in traveling. So those who had troubles with the earlier version of the case will not have to worry about that design flaw. The outer body of the case is made from hard polyurethane material and is decorated with a carbon fiber skin. The case is not waterproof, but it is water resistant. So, if you spill some liquid, it will not ruin the case. However, just don’t take it with you while scuba diving. It is the cheapest option on the list and ideal for those on a budget. It costs $9.99 only. Vape bags are not for frequent travelers only, but also for those who like to keep their stuff organized. By discussing the five best vape bags, we have tried to make your endeavor easy. Use this guide as a reference, do a quick analysis on your own and then select the one that best suits your preferences. Keep in mind the build quality, size, design, and finish of the bag before picking a bag. Don’t forget to test the zippers and the elasticity of the netting and straps. They should be stretchable and strong enough to lock in your hardware. If they snap, your vaping gear will be like a coin in a soda can. Putting in a little effort and choosing the right bag can go a long way to making your vaping experience more fun, for many years to come.